We have news about our adoption. We have decided to pursue adopting a waiting child using a different adoption agency. Watch our video to hear our announcement. Check out this website http://www.rundarenrun.com. 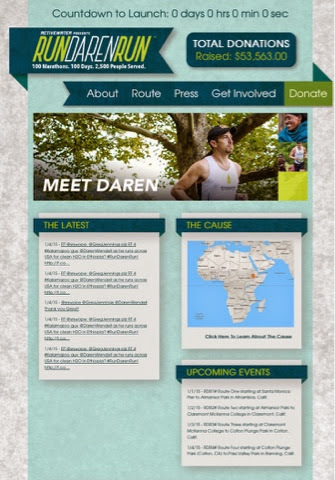 Daren is running 100 marathons in 100 days to raise money for clean water in Ethiopian communities. I'm so impressed with his goals and ability to use his gifts to help others for the glory of God. He will be running through my town of Amarillo February 8th and 9th. I don't know about you, but I'm hoping to give him a high-five. Water is such a basic need, and there is no reason these communities Ethiopia shouldn't have that need met. Please consider donating to his cause! For a while I have been considering whether or not God was calling me to go on a mission trip to Ethiopia this summer with our agency adoption agency AWAA. Our agency has ACT mission trips to different countries to care for orphans in the orphanages and transition homes that they work with. So now I was sure I was going. That night I began to fill out the online application for the mission trip, but I wanted to make sure I picked the right dates. I was pretty sure that our new friends from Perryton would be going on the trip July, and I could go at the same time. 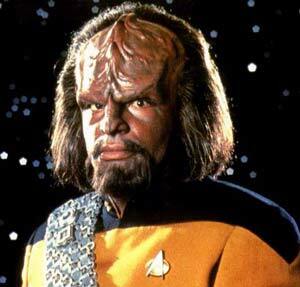 But I found out pretty quickly that they had accepted a referral for two little boys from Ethiopia. Since they will be traveling for court dates and to bring home their boys soon, they would not be going on the July mission trip. My other new friends that are adopting from Ethiopia, Barry and Shelly Wilson, from Amarillo, expressed interest in going on the mission trip in August. It would be just an extra blessing to get to know them better as we serve together on the trip. August 15-24th are the dates. I almost want to start packing my bags now. I can't wait to get my hands on those orphans and be Jesus's love to them in a real way. I am praying for them all the time, but being a tangible blessing to them will be such a blessing to me. I have absolutely no expectations of finding the little boy we are going to adopt or picking out a kid. I want to look at everyone of those boys and girls with a fierce love in an equal way. I just want to serve them, even if it in a extremely small way and for only a few days. I love how the book of James puts it in James 1:27, "Pure and undefiled religion before our God and Father is this: to look after orphans and widows in their distress and to keep oneself unstained by the world." How I long for that worship that is pure and undefiled to the One I love. James had planned to go to South Sudan in January on a Citychurch mission trip. That trip has been postponed because of the violence and potential civil war that has been happening there since the last week of December. Since he did not go to Africa in January, he has been invited to go on a mission trip to Burkina Faso with Lost But Not Forgotten ministries in March. Please be praying for that trip. The villages that they will be visiting are mainly Muslim. James is going with the express focus of reaching children in those villages for Christ. Praise God for opportunities to serve as missionaries to Africa! Guess Wot his my new favorite food? You're Shiro to guess it Tibs Ethiopian! Driving into DFW last night, it was just about dinner time. After letting my parents know we were about an hour away from their house for our Thanksgiving week visit, I asked James if he wanted to do something crazy and go eat Ethiopian food. Why not? We headed east on 114 toward Dallas to try a restaurant that gets it's name from the capital city of Ethiopia, Addis Ababa. I had searched out the Ethiopian restaurant with the best Urbanspoon rating, a 92% out of 210 votes is extra good. Make that 211 vote, because I just gave it a thumbs up. Here is what we ordered. I'm still not sure what menu item name went with each dish on our platter, but I liked ALL of it! Lucy, James, and I got our own plate of rolled up injera bread, and we all dug in. Gabe ate a little from my bread and pieces of meat, which he called "chicken nuggets." Andrew chickened out with his chicken spaghetti, which James assures me is actually something eaten quite often in Africa (except usually with fish instead of chicken.) He braved up right before leaving and tried a few bites off the platter. James has eaten at an Ethiopian restaurant in a cave (he insists it was in a cave, I know that sounds crazy) in South Sudan. He also ate in an Ethiopian restaurant in a hotel in South Sudan. Flying to South Sudan, they had a layover in Ethiopia, and they ate there. So I was curious to know if what we were eating was comparable to the African food he ate in Africa. His verdict. Yes. He said it was if the guy in the cave could have had access to better sources of fresh groceries, they would have been exactly alike. The only difference, besides the freshness of the food, was that the meat was less gamey. I felt so excited to finally have a little piece of Ethiopia tangibly setting in front of me. I was enamored with smelling everything. I have been reading and dreaming of Ethiopia since March, and now I could see, smell, taste a little piece of it. It was lovely. It is nothing compared to that day in our future when we get to step off a plane, God willing, and meet a little boy who will join our family, but it was something. Bless that food, God! Thank you, Lord. Your dollar can be powerful. I don't know about you, but during Christmas I have a lot of dollars going my door. We spend a lot of money this time of year. This Christmas I have made a decision try to make my dollars count in a more meaningful way. I'm going to do that by trying to buy many of my Christmas gifts from families raising money for international adoptions, companies who employ under-resourced workers, and companies who cycle profits into vulnerable communities, and retailers making a difference. I've compiled a list of great gifts I've found that meet these qualifications. Gotta make the joke; if you love buying scarves, you'll be set! But seriously, I have over 30 gifts below that are varied as they are charitable. This families is selling t-shirts and the proceeds actually go to orphanage supplies. The Heckart family lives here in the panhandle of Texas, and they are on our agency's list hoping to adopt siblings from Ethiopia. Click here to buy Radical Obedience t-shirt. The Anglin Family are from Lubbock, Texas, and they are on our agency's list to adopt from Ethiopia as well. They are selling jewelry and t-shirts to raise money for their adoption. Click here to buy the hammered copper cuff bracelet. Click here to buy the Love Africa Tee. This family is adopting two children from the Congo. She has some cute pillowcases for sale in her Etsy shop. You just gotta love the fox print. She also has bears, owls, boats, Hawaiian print, elephants, bike print, and more. And she offers gift wrapping for $4. Click here to buy Flannel What Does Fox Say Pillowcases. This family is adopting a child from South Africa. I love this set of three wooden signs for a boys room. Click here to buy wooden boys room signs. The Pranther family is on our Agency's list to adopt from Ethiopia. She has cute scarves for boys for sell in her Etsy shop. Her shop also includes some cute hats and headbands. Click here to buy the infinity scarf for boys. Ordinary Hero apparel. The Daigle family is adopting from our agency. They are requesting a boy age 2-8. When you check out, choose Laurie Daigle as the affiliate name, and 40% of your purchase goes toward the Daigle adoption! Click here to buy jacket. Sseko sandals from Come Together Trading. Sseko sandals are crafted from handmade leather by women in Uganda. The base is sold separately from the straps, and is available in Women's 5-11. Sseko \say-ko\ Designs was created to help bright young women continue their education. Click here to buy Sseko sandals. Miniature Wooden Animals in a Banana Fiber Box from Come Together Trading. Made in Kenya. Click here to buy wooden animals. Tree of Life Trivet from Come Together Trading. Made in Saharanpur, a city in northern India that is a traditional center of wood carving, this trivet is created by an artisan who recently began working on his own designs, thanks to fair trade sales. Asha Handicrafts has been a leading fair trade organization in India for over 30 years. Asha, which in Sanskrit means hope, is a non-profit organization that was started in 1975 with the mandate to Trade, Train & Transform. Committed to the values of preserving the diverse craft traditions of India and ensuring a fair wage for artisans, Asha's model is to do business in a way that transforms lives. Today, Asha is impacting the lives of hundreds of artisans, working with more than fifty cooperatives and family workshops throughout India. Click here to buy trivet. Women's jackets from Rising International. Handmade by Nepalese women. Nepal is a country that is especially venerable to slave trade and trafficking women. The Open Arms shop in Austin, Texas. Every year, thousands of refugees flee oppression around the world and are resettled in America. To help them avoid the trap of poverty, Open Arms employs them at a living wage, using re-purposed t-shirts to create one-of-a-kind products you'll enjoy. Click here to buy the Jaqualina Infinity Scarf. Click here to buy the Claudina Black Skirt. PRE-ORDER - Chicken baby/toddler leggings from LaraCasey. ALL profits from these chicken leggings will go to Heifer International, an organization dedicated to ending world hunger and poverty by donating chicks (and other livestock) to families across the globe. Click here to pre-order chicken leggings. Mossy Rock Design Prints - 20% of my earnings from Etsy sales go towards buying diapers, formula, etc for orphanages in Ethiopia. Click here to buy Little Friends 10 x 10 print. Handmade African throw pillow Feed the Orphans.com. All proceeds provide food, clean water, and medicine to children in need. Click here to buy handmade African throw pillow. Red strands necklace from Project Hopeful. Proceeds help fund adoptions of HIV positive children. Click here to buy Red Strands necklace. 147 Million Orphan baseball tee from Project Hopeful. Click here to buy Project Hopeful t-shirt. Handcrafted bead from recycled magazines A Hope is a Christian job creation ministry empowering the disadvantaged and those suffering from HIV/AIDS in South Africa. Click here to buy Handcrafted Beaded Necklace. Hope Bag from Freeset, where you and I can find beautiful, well-crafted products while simultaneously fighting human trafficking. Click here to buy the Hope Bag. Seble Scarf from LiveFashionABLE. They create sustainable business for Africans. Click here to buy the Seble scarf. Tigist clutch purse from LiveFashionABLE. FashionABLE products are named after a woman whose life has been changed because of your purchase. Click here to buy Tigist clutch. Click here to buy Kalkidan wallet. T-shirt designed by an orphan feeds an orphan for 1 month. Siphamandia Hiabisa, an orphan from South Africa, designed this shirt sold by Common Threadz. This design is sold on jackets, long sleeve tees, kids tees, and gowns as well. Click here to buy t-shirt. Leather Traveler bag from Red Earth Trading Company. Made in Uganda. Red Earth Trading Co. was founded in 2010 with the mission of creating a brand that is as life changing as it is fashionable. Not only are our artisan families and communities benefiting from the work, but we also give 5% of every purchase to sustain the community development work of Know Think Act. Click here to buy the Leather Traveler Bag. Red Ugandan paper bead cuff bracelet from Funky Fish Designs. - helps HIV positive widows in Uganda. They are created by a group of HIV+ widows and single mothers in Mukono, Uganda. We chose red because it is the signature color for Aids awareness. Click here to buy beaded bracelet. Hanging Art Bird Feeder from The Hunger Site. Every purchase fights famine in the horn of Africa and combats hunger in the United States. This purchase funds 50 cups of food. Click here to buy hanging bird feeder. Fluttering Butterflies Gear Toy from The Hunger Site. Every purchase fights famine in the horn of Africa and combats hunger in the United States. This purchase funds 25 cups of food. They have lots of preschool toys. Click here to buy fluttering butterflies toy. Bake & Decorate Cupcake Play Set from The Hunger Site. Every purchase fights famine in the horn of Africa and combats hunger in the United States. This purchase funds 50 cups of food. Click here to buy cupcake toy. Micro Cars Carrying Case Playset from The Hunger Site. Every purchase fights famine in the horn of Africa and combats hunger in the United States. This purchase funds 50 cups of food. Click here to buy micro cars toy. Grey Scoop-Neck Tee + White Blanket Design from Neary on Raven and Lily.com. Hand-printed in Cambodia, these eco-friendly shirts are made with remnant, natural-dyed jersey cotton by HIV positive and formerly trafficked women. In addition to providing sustainable economic opportunities, Raven + Lily returns proceeds to fund healthcare and literacy programs for the women and children in this community. Click here to buy Tee. Mango + Grapefruit Candle from Silver Lake on Raven and Lily.com. This soy candle is hand-poured by women at the Downtown Women's Center in Los Angeles. Raven + Lily is proud to support their efforts to provide creative job skills to previously homeless women. Click here to buy candle. Hand loomed Cotton Scarf from 14:Hope. Made in Addis Abba, Ethiopia. Proceeds go to orphan care and prevention in Ethiopia. Click here to buy scarf. We have had our completed home study in hand for a little over a week now, and we are now waiting for the government to schedule our biometrics (a fancy word for fingerprinting) appointment. Once that is done, Homeland security will send us our last form needed to complete our dossier! Our paperwork pieces are coming together. It turns out that it is due with our dossier submission as well! So if you good at math, you can add up that we need to send a $8,150 check with our paperwork. The good news is that we have well over half of that raised already, and we have been busy making fundraiser signs all weekend. The better news is that God is in control, and I know he is going to provide every penny we need to write that check. I am humbled by all of the many families and individuals that have contributed to our adoption in some way or another so far. As they've donated and given, I have been adding their names to our puzzle pieces. When I look at those pieces with friends and families names all in a pile, my heart is full of appreciation and hope! I also know that God is never surprised by the details. We are talking about the God who overflows cups and gives abundantly. I have faith that our pieces to our money puzzle are coming together as well. Yesterday I found out that Netflix just added the documentary Stuck to their streaming movies. So James and I decided it was movie night with the kids. I've been wanting to see it since the summer, and I was so excited to finally get to watch it. As we turned it on, Lucy jokingly asked how long dad thought we could go without tearing up. It turns out we made it about 1 minute. 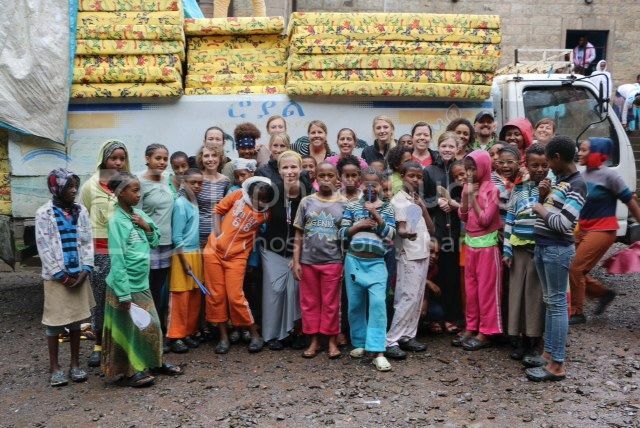 It was so amazing to see the footage of Ethiopia! I can't wait to go there. It even showed the court process in Ethiopia for two families. Gah. I was verklempt. I assumed that the movie would be a huge encouragement to me, but the truth is that after watching it my heart is so heavy. My heart not only hearts for my little guy in Africa, but for the millions of orphans all over the world, especially those in orphanages. Stuck is a must watch. It very well produced and extremely eye opening. If you have Netflix streaming, you must watch it soon. This weekend we had a picnic with some other families adopting from Ethiopia from our area. One family was the Cavitt family that I previously blogged about. They adopted their beautiful daughter from Ethiopia 6 years ago. I loved hearing everyone share pieces of their adoption journeys. 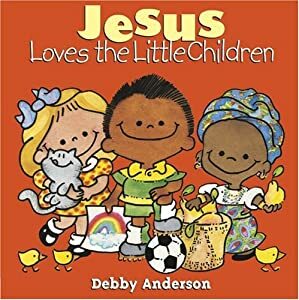 One of the best things about the day was Pam Cavitt brought a stack of Ethiopian, African, and adoption children's books to show everyone. She graciously email us a great list. Here is her list. I'm excited to say that I found several of these books on half.com for 75 cents. If you are adopting, or need a gift idea for someone who is adopting, or just want your kids to know more about Africa and adoption, here are some ideas. Since Pam Cavitt's daughter has such gorgeous hair, Pam was also generous to share some hair resources. If you have never seen the Sesame Street "I Love My Hair'" video, you have to check this out! This list adapted from C.A.S.E- The Center for Adoption Support and Education. The family that lives in Dalhart just returned from a mission trip to Ethiopia, and they are planning to adopt a set of siblings. They had amazing pictures and stories to share. I was entralled. Another family from Dalhart also went on the mission trip and met a teenage girl that they are now working to adopt. I loved every second of the whole evening. I couldn’t get enough of their testimonies. It was so affirming to me to see God working in these families from my area, families that I had never met. Our God was speaking to each of us with the same mission, the same calling. God called each of our families because of His’s love for orphans living 8,000 miles away from where we sat. We prayed for those little ones. We made them goodie bags. It was a FABULOUS night. I was so moved by their love for Ethiopia and the African children that they will soon call son or daughter. It is amazing to think that in the last 9 months, God, separately called these 4 families (and two other families in Lubbock) to adopt from Ethiopia. I was so thankful for these women whose hearts have been molded. Their hearts, like mine, had been forever changed by the faith adventure of international adoption. I am so thankful. I am so excited that some day, when we finally have the little boy home, we will not be alone in our journey. God is raising up a community for these children right here in Amarillo, Texas. And more importantly, he has five little ones in Ethiopia that he has made special plans for, plans to set them in forever families. The tragedy and loss that those little ones are going through, will still be going through, is not God's best for them, but He is working. God is working, and we are working because He is working. We are excited about the BBQ fundraiser we will have going on next week. James is excellent at smoking meat. So we are putting his talents to work to raise some money for our adoption. (I'm also pretty good at pie making. They will have homemade crusts.) We will only be able to take up to 10 orders, so get your order in quick!